Various test methods exist for measuring heat of cement hydration; however, most current methods require expensive equipment, complex testing procedures, and/or extensive time, thus not being suitable for field application. The objectives of this research are to identify, develop, and evaluate a standard test procedure for characterization and quality control of pavement concrete mixtures using a calorimetry technique. This research project has three phases. 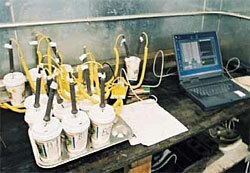 Phase I was designed to identify the user needs, including performance requirements and precision and bias limits, and to synthesize existing test methods for monitoring the heat of hydration, including device types, configurations, test procedures, measurements, advantages, disadvantages, applications, and accuracy. Phase II was designed to conduct experimental work to evaluate the calorimetry equipment recommended from the Phase I study and to develop a standard test procedure for using the equipment and interpreting the test results. Phase II also includes the development of models and computer programs for prediction of concrete pavement performance based on the characteristics of heat evolution curves. Phase III was designed to study for further development of a much simpler, inexpensive calorimeter for field concrete. In this report, the results from the Phase I study are presented, the plan for the Phase II study is described, and the recommendations for Phase III study are outlined. Phase I has been completed through three major activities: (1) collecting input and advice from the members of the project Technical Working Group (TWG), (2) conducting a literature survey, and (3) performing trials at the CP Tech Center?s research lab. The research results indicate that in addition to predicting maturity/strength, concrete heat evolution test results can also be used for (1) forecasting concrete setting time, (2) specifying curing period, (3) estimating risk of thermal cracking, (4) assessing pavement sawing/finishing time, (5) characterizing cement features, (6) identifying incompatibility of cementitious materials, (7) verifying concrete mix proportions, and (8) selecting materials and/or mix designs for given environmental conditions. Besides concrete materials and mix proportions, the configuration of the calorimeter device, sample size, mixing procedure, and testing environment (temperature) also have significant influences on features of concrete heat evolution process. The research team has found that although various calorimeter tests have been conducted for assorted purposes and the potential uses of calorimeter tests are clear, there is no consensus on how to utilize the heat evolution curves to characterize concrete materials and how to effectively relate the characteristics of heat evolution curves to concrete pavement performance. The goal of the Phase II study is to close these gaps.